Staphylococcus aureus (or "golden staph", aureus meaning gold in Latin) is a bacterium commonly found on the skin, in the throat or in the nose of many healthy humans. This pathogen can cause minor skin infections (such as pimples and boils) and abscesses, but can also cause life-threatening diseases such as pneumonia, meningitis, endocarditis and septicemia. This major pathogen is responsible for both nosocomial (ie acquired in the hospital) and community-acquired infections. Since the 60s, the emergence of multiresistant strains of S. aureus carrying resistance to methicillin (MRSA, Methicillin Resistant S. aureus) and to most currently available antibiotics has dramatically narrowed the therapeutic arsenal to the exclusive use of glycopeptides (such as vancomycin and teicoplanin) as the mainstay of MRSA treatment. Unfortunately, vancomycin overuse has led to the emergence of MRSA strains with decreased susceptibilities to glycopeptides. Fig. 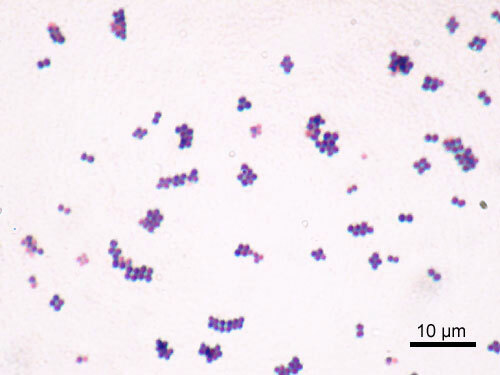 1: Microscopic view of S. aureus using Gram staining (x1000). The presence of MRSA in an institution is clearly paralleled by an increased number of bacteremias due to MRSA, which carry a threefold attributable cost and a threefold excess length of hospital stay when compared with methicillin-susceptible S. aureus (MSSA) bacteremia. Attachment during infection occurs via the binding of dedicated bacterial surface receptors to host matrix proteins. This group of surface-exposed proteins is now collectively referred to as MSCRAMMs (microbial surface components recognizing adhesive matrix molecules). Our group has especially studied fibrinogen- and the fibronectin-binding adhesins. Levels of these adhesins can be modulated upon bacterial exposure to sub-inhibitory concentrations of antimicrobial quinolones1,2, or when the bacteria displays specific phenotypes, such as resistance to glycopeptides3 or a “dormant state” called small-colony variant S. aureus4. These adhesins have also shown essential in the development of endocarditis5,6. Our group has also contributed to the study of prevention7, 8 and therapy7, 8,9,10 of experimental foreign-body infections.